Size: 1,150 sq. ft. "m/l including Florida Room"
All this 1978 NOBI manufactured home needs is you and your clothes! There’s a cute grocery getter (Chevy Cavillier) and a golf cart that can be negotiated with this purchase. WOW! This home has over 1,100 sq ft including the Florida room. NEW sub and finish flooring and there’s a picture of the flooring because it’s BEAUTIFUL. This home is located in beautiful, friendly Buccaneer Estates. 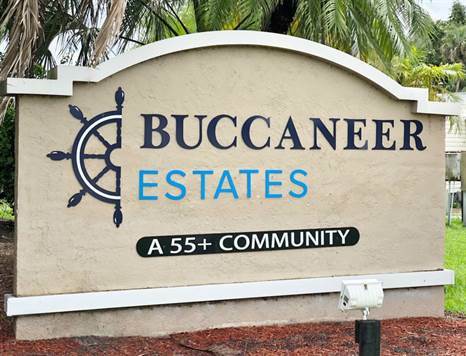 Buccaneer Estates is loaded with amenities TWO swimming pools, sauna, hot tub, laundry mat, club house, hospitality house, exercise rooms, horse shoes, shuffleboard, billiards and activities coordinated by the residents. This location is close to medical and municipal services, as well as HISTORIC DOWNTOWN FORT MYERS, FL, SANIBEL and CAPTIVA ISLANDS, FORT MYERS BEACH, EDISON AND FORD WINTER ESTATES, SANIBEL OUTLET MALL, BELL TOWER SHOPS, MIROMAR OUTLETS, GULF COAST TOWN CENTER, VA MEDICAL CENTER, and MUCH, MORE. Lot rent is approximately $750 and includes lawn care and use of all amenities. Other fees are pass-through tax, water, sewer and trash and add approximately $100 to monthly expenses.